Succulents no longer need to be limited to container plantings. They’re right at home in the landscape. I have been growing succulent plants since the early 1970s and continue to appreciate their many uses in the landscape. In recent years, the wider world of gardening and horticulture has picked up on this trend. Succulents are hot! Landscape professionals and home gardeners throughout Northern California and beyond are expanding their plant palettes to include these uniquely functional plants. Over the last couple of years, landscape architects and designers have reported to me that many clients are asking specifically for a custom-designed succulent garden. This is a big moment for succulents. Until recently, home gardeners experimented with succulents in the garden and professionals suggested introducing succulents into their client’s landscape. Today, the clients request succulent gardens. As I have learned, not all succulents are alike. Success lies in selecting varieties adapted to your garden’s unique growing conditions. The variety of succulents to choose from is much greater in frost-free climates and becomes limited where winters are more extreme. For those of you with more extreme winters, rely on good plant labels, the internet, and local knowledge from succulent enthusiasts—often members of the Cactus and Succulent Society. There are also books and publications to help guide you. 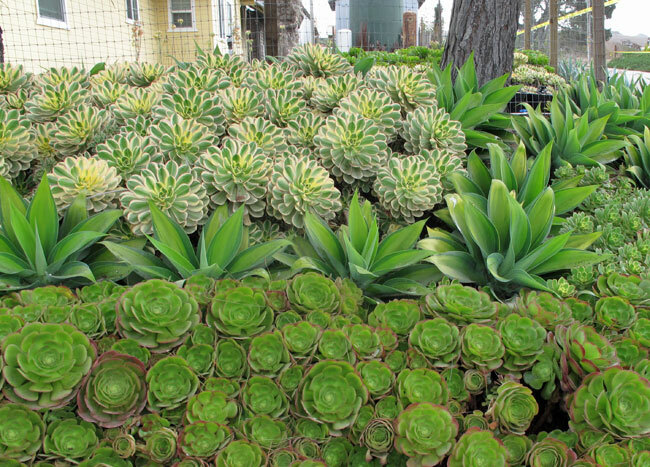 How you combine succulent plants offers even more options for creative landscaping. I like to work in large sweeps of a single variety planted en masse accented by a few contrasting plants. Working with a limited palette is a dramatic approach, especially in smaller gardens. Many people ask me, “How do I know which plants are compatible with one another?” Most succulents play well with others and are perfectly suited for combining provided they receive the light they need. I work with Aeonium, Agave, Aloe, Crassula, Echeveria, Sedum, and Sempervivum interchangeably and have had few problems. 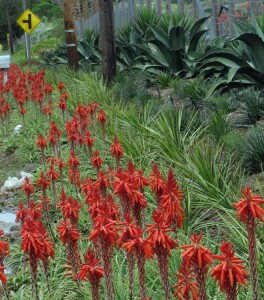 The crimson flowers of aloe attract hummingbirds and offer winter color in the garden. Photo: Katie Elzer-Peters. Succulent flowers are spectacular in the landscape and make excellent additions to cut flower bouquets. Winter-flowering aloe adds color in an otherwise quiet time in the garden. Varieties bloom in shades of orange, yellow, red, and even white, like Aloe tomentosa. The bicolored blooms of A. speciosa are exceptional. Echeveria is a reliable bloomer, producing sprays of color during the summer months. If you like your garden to attract birds, hummingbirds flock to both aloe and echeveria blossoms. And as aeonium begin to bloom, the leafy rosette transforms into a showy pyramid of brilliant flowers. Prune flowerheads after blooming to allow the plant to regenerate and form new rosettes on the lower part of the remaining stem. Remove spent flowers on hybrid echeverias to tidy the landscape. Landscaping with succulent plants is a hot trend that continues to increase in popularity as people learn to appreciate their beauty and utility. 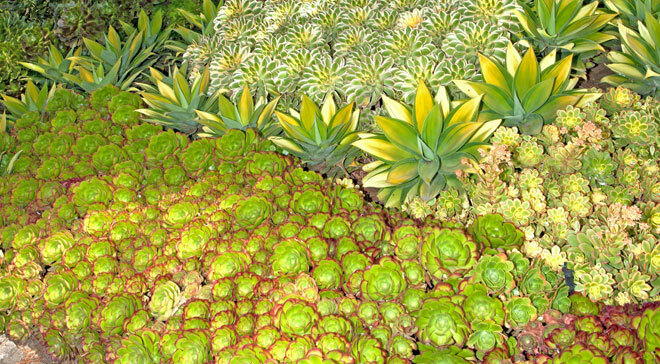 Succulent foliage offers a wide range of color choices and some quite spectacular flowers, all of which combine to create attractive, low-maintenance, and resilient gardens. • Provide porous, well-aerated soil. 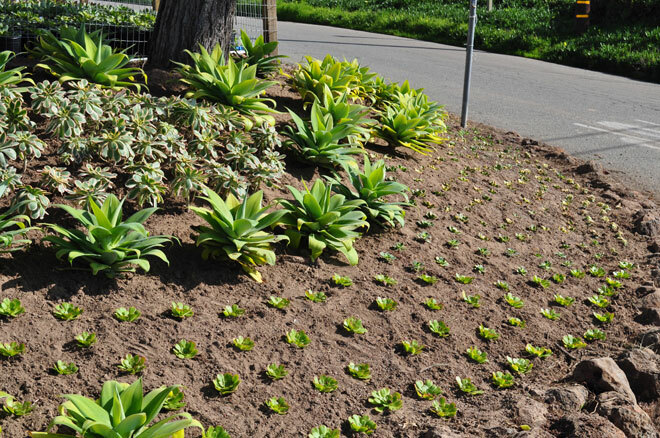 Succulents can handle diverse soil types provided water drains away from the plants during the rainy season. • Build a raised bed to counter poor drainage; most succulents are shallow-rooted, so making a raised bed that is 10 to 15 inches deep will suffice for your new succulent garden. efficient at collecting, storing, and using water and seldom need irrigating more than once a week. • Fertilize your established succulents with a general purpose fertilizer used at one-half to one-third the recommended dose once every one to three months to maintain healthy growth. In February 2011, we planted a new bed at Succulent Gardens, my retail nursery. The nursery is located three miles from Monterey Bay and adjacent to the Elkhorn Slough, characterized by mild winters and cool, foggy summers. The garden is composed of four kinds of variegated plants: Aeonium ‘Sunburst’, which will grow to a height of about three to four feet, crowns the planting, fronted by a staggered row of Agave attenuata ‘Kara’s Stripes’. 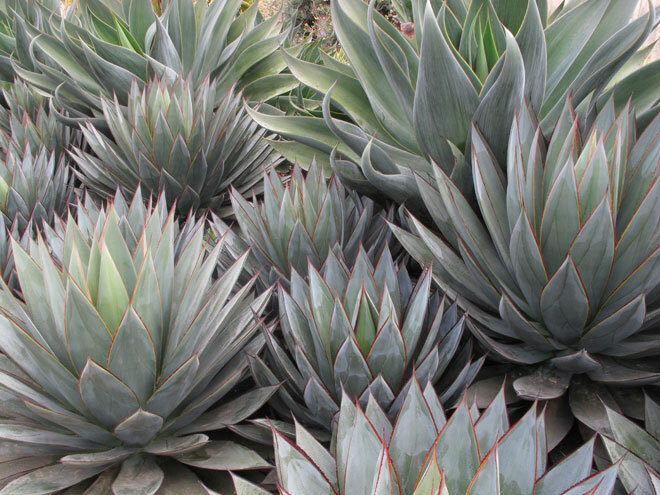 The agave is slow growing but will eventually grow to about four feet in diameter and will probably overtake ‘Sunburst’ in about five years. Aeonium ‘Kiwi’ is a shrubby succulent growing to about 15 inches tall with green and yellow variegation and a red blush along leaf margins. Aeonium ‘Blushing Beauty’ is a low-growing, freely branching succulent with multiple six-inch-diameter rosettes that skirt the base of the bed above a border of moss rocks that help retain the 30 percent slope. With maturity, the colors in each of these varieties will intensify. When first planted, our garden was watered about every ten days using an overhead sprinkler. Now we water about once a month during the growing season from April through October and, unless we have a particularly dry winter, watering stops altogether once the rains return, usually around November. Eighteen months later the composition has changed significantly. Aeonium ‘Blushing Beauty’ has developed red leaf margins and variegation on Agave ‘Kara’s Stripes’. subtle on plants just out of the greenhouse, strengthen within days of moving the plants into direct sunlight. Aeonium ‘Kiwi’ and ‘Blushing Beauty’ have both filled in and produced offsets as they have matured. The soil in our garden is very fine sand with little organic matter. To date, we have never fertilized. Beginning next spring, I plan to start fertilizing about every three months. To maintain proper spacing, air circulation, and a cohesive design, we will have to divide and reset some of the plants in this landscape bed after two to three years.